The Salvation Army was founded in 1865 by a Methodist street preacher named William Booth. He worked with people in the slums of East London. In 1880, The Salvation Army began work in the United States and in a few short years the ministry of The Salvation Army spread across the country, reaching the streets of Superior in 1897.During World War II, The Salvation Army operated 3,000 service units for the armed forces...and led in the formation of the USO. Since World War II, the Army has continued its own worldwide program.Today The Salvation Army continues to work where the need is greatest, motivated by its faith in God and its love for all people. The Salvation Army is now serving 'the least of these' in over 127 countries. Captain Jasen Elcombe is originally from Duluth, MN. He grew up in a Christian family and attended a Lutheran church most of his life. 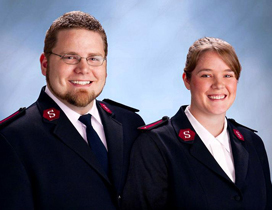 After meeting his wife the two started attending The Salvation Army in Duluth and helped to start a praise band at the corps there. A couple years later he accepted the call from God into full-time ministry within The Salvation Army. “I love how welcoming The Salvation Army is and I love that they help people outside of the church walls,” says Captain Jasen. This is a big part of why he is an officer today. It’s all about helping others and sharing the love of Jesus.